I heard this loud chopping sound in some pine woods. On closer observation I saw this red head oscillating back and forth making a large hole. It was about 50 ft up in the tree, and was shaded, and paid no attention to me as I tried to get a photo. It then went from tree to tree hammering away. Later in the day I heard it again and found it at near ground level. The lighting was slightly better, so I tried to get a photo as soon as I could. I kept moving in closer until I was about 20 ft away with the Woodpecker hammering away and oblivious to me. The head was bobbing so fast, and the noise so loud, that it was still hard to get a good photo. Great shot. I’m sure this is a rare opportunity. Thanks for posting. I have one of these birds in my front yard which is a forest area. very good read and thus I was in fact pretty joyful to read the blog post. We have 2 in our woods, we have owned our home for a little over 2 years and have a little over 6 acres and was amazed when we saw them! They don’t stay in one place for long so it’s hard to get a picture 😦 They are kind of ugly but very cool to see!! 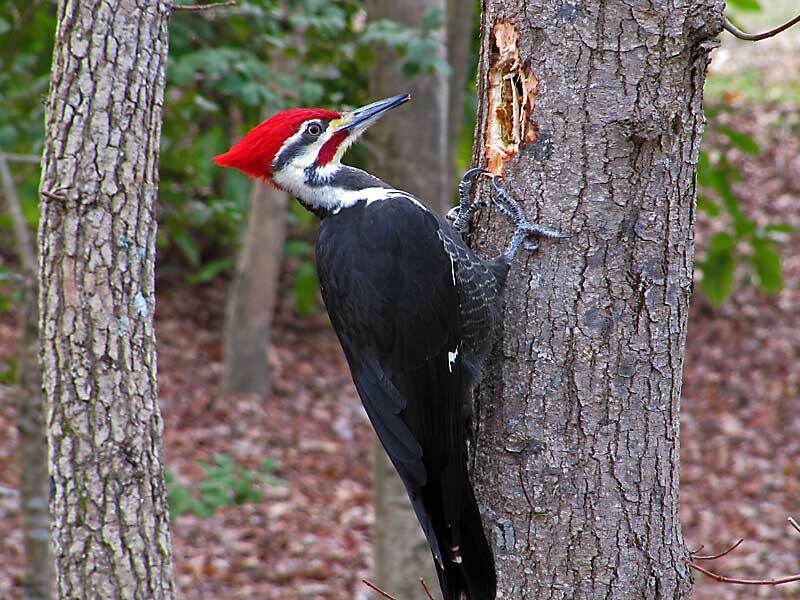 I saw 2 of these birds in my backyard last evening in New Bern, NC. They were quite larger than the average woodpecker, at first I thought they were some kind of waterfowl but they were clinging to the side of a tree which I know waterfowl would not be able to do that because of their webbed feet. Is it OK to post your photo on our neighborhood website? One has been spotted in our neighborhood. I will take it down if you object. Thanks. One of these woodpeckers was sitting on my window ledge pecking at the window. This is on a side of our house that is wooded. My husband says he looks “cute” I took his picture with my iphone. We live in Powell, Ohio.